In order to address the numerous public health and environmental challenges posed by industrial meat production, it is essential for the U.S. livestock industry to not only lead by example, but to also learn from the approaches and advances occurring in other countries. This section offers an overview of global trends in meat production, as well as a snapshot of the livestock industry in five countries: Australia, Brazil, China, the Netherlands, and South Africa. The meat industry in Australia has distinguished itself for the production of high-quality pasture-raised beef and other specialty meats, such as sheep, goat, and lamb, often for export to other countries. Australian livestock generally graze on open ranges for most of their lives, and are moved to a feedlot for the last 50-120 days before slaughter. Livestock grazing is the most common use of agricultural land on this arid continent. Perhaps as a result of the practice of open pasture grazing and the importance of ensuring the safety of exports, livestock production is monitored very closely in Australia. Australia's National Livestock Identification System (NLIS) is a monitoring program in which cattle, sheep, and goats in Australia are tagged and their movements tracked by producers using a web-based interface. This monitoring system speeds up emergency disease response, helps control disease outbreaks, and can help ensure that animals are not exposed to chemical contamination. While Australia's NLIS is a very innovative approach to meat traceability, the data collected through NLIS is not currently available to the public. If the United States adopted a system like the NLIS and made the relevant data publicly available, it could greatly improve consumers' knowledge about where their meat comes from, and in turn would allow environmentally-conscious consumers to make more informed buying choices. Brazil: concentration to combat deforestation? Export data for livestock in Brazil, 1970-2010. Cattle and poultry are the top two types of livestock produced in Brazil. As the headquarters of JBS, Brazil is the world's leading exporter of broiler meat and the third largest broiler producer. While poultry CAFOs have been used in Brazil since the 1960s, with production concentrated in the southern half of the country, the cattle industry has only recently shifted from pasture grazing towards use of the CAFO model. Brazil’s ABC Plan provides loans to farmers to adopt the CAFO model to minimize the greenhouse gas emissions that would otherwise result from deforestation to expand pasture lands. This policy has helped Brazil maintain its market share of the global meat trade while reducing its carbon footprint. However, this policy tends to ignore the other environmental impacts of CAFOs. A close look at Brazilian meat production underscores the need for responsive livestock production and waste management policies that take into account both the economic incentives and environmental costs underlying the CAFO production model. On one hand, the CAFO model is praised for its lower production costs and its land use efficiency, which are especially important in an economy focused on exports and where deforestation poses a serious environmental problem. However, increased CAFO use may contribute to deforestation in other ways, as more land is brought into cultivation for crops like corn and soybeans to supply animal feed. The Netherlands is one of the most intensive producers of animals in the world, producing an average of 450 million animals every year. Those animals, in turn, produce over 70 million tons of manure each year. Map of hog production in Europe, with concentration clearly in the Netherlands. Source: Eurostat, 2013. Perhaps as a consequence of such highly concentrated production, the Netherlands has been a leader in the development and use of innovative technology to solve the problems of waste management, environmental health and animal welfare, which advocates describe as "sustainable intensification." The Netherlands has been on the vanguard of development and use of end-of-pipe systems in order to mitigate air pollution from CAFOs. These systems are commonly called "scrubbers," and they allow waste product to be disposed of safely, reused or reprocessed depending on its chemical composition. These systems may operate differently depending on what types of pollutants need to be removed; some scrubbers employ chemical agents, such as sulphuric acid, to clean the gas, whereas others use biological processes. Acid scrubbers reduce emissions by close to 100%, and bioscrubbers by around 70%. New "multi-pollutant scrubbers” have the potential to remove odor and particulate matter (PM10 and PM2.5) as well as ammonia, both of which are extremely promising developments. Implementing multi-pollutant scrubbers more widely would enable the Netherlands to further reduce the public health and environmental justice issues associated with CAFOs. By reducing ammonia emissions, scrubbers can help prevent costly environmental damage that could otherwise undermine long-term agricultural productivity. The Food and Agriculture Organization defines livestock farming in South Africa into two categories: freehold farming systems and communal farming systems. In this definition, freehold farms are on bounded property with the goal of commercial production, while communal farms/grazing areas lack boundaries and typically consist of grazing animals owned by subsistence farmers in rural areas of the country. Communal farmers primarily sell the meat to local markets and use it for their own households, while commercial farming accounts for 75% of South Africa's livestock production. In South Africa, antibiotics are regularly used to treat and prevent animal diseases and to promote growth. Furthermore, the distribution and use of counterfeit pharmaceuticals is a common problem in South Africa; in fact, an estimated one in five medicines sold are believed to be counterfeit. 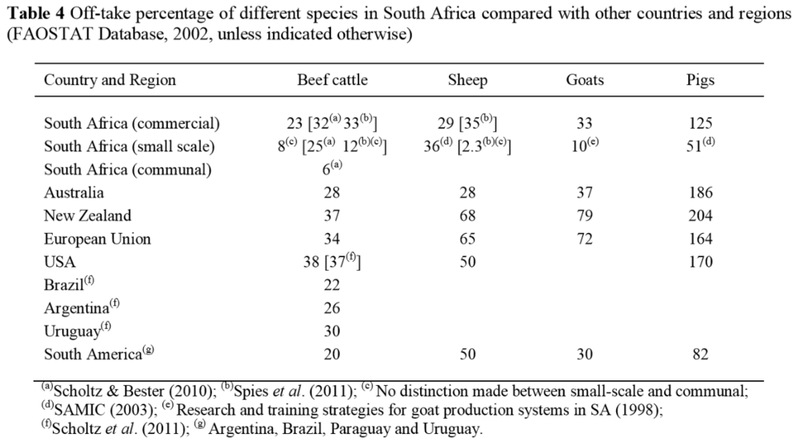 While there is industry-provided data estimating the use of antibiotics and antimicrobials in South African livestock production, these studies almost certainly underestimate the true rate of antibiotic and antimicrobial use. 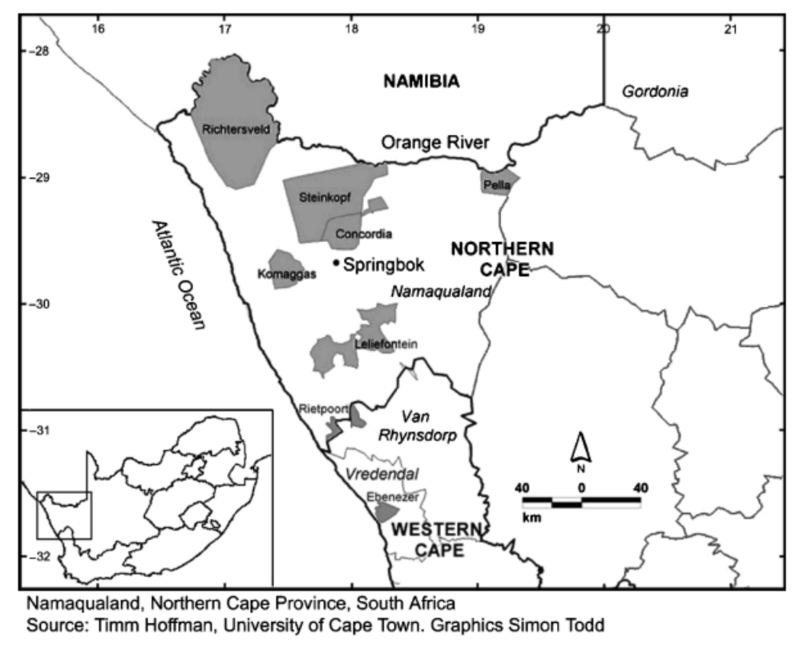 The presence of counterfeit pharmaceuticals in South African livestock production only serves to highlight a much broader problem of uncertainty around antibiotic use on CAFOs in other places, including the United States. Consumer opposition to antibiotic use has led major producers in the United States, such as Tyson and Perdue, to shift away from the use of antibiotics in their products. 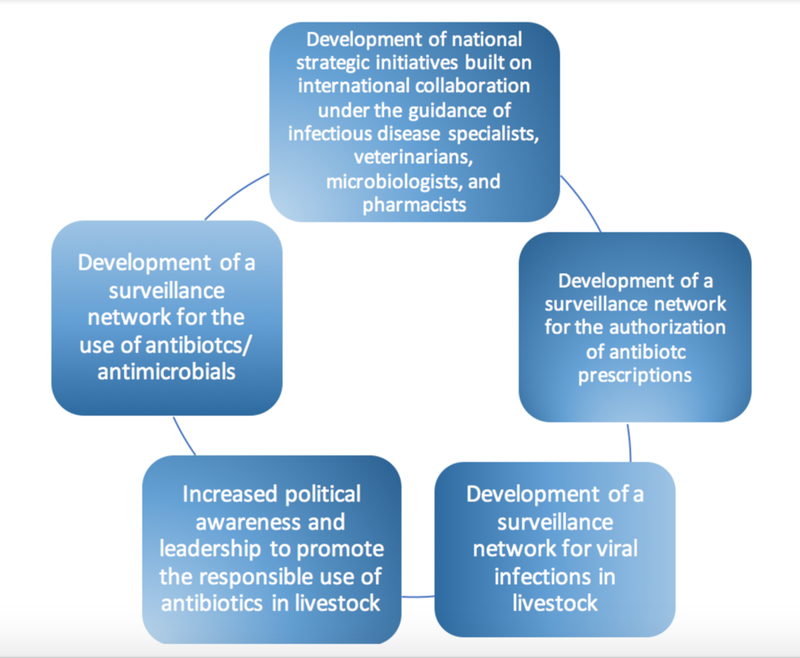 The charts above document the problem of antibiotic resistance in South Africa; below, a framework proposed by our team for increasing accountability in the use of antibiotics on livestock. Whatever the global fate of CAFOs may be, it will likely have the largest impact in China. China is the largest producer and consumer of meat and grain; with less than 10% of the world’s arable land, China feeds over 20% of the world’s population. CAFOs were first introduced to China in the late 1970’s, during a time of broader economic and agricultural reform. More producers shifted to CAFOs when import tariffs on livestock feed were reduced, which allowed producers to import large quantities of feed. Sustained economic growth in China has created a new and rapidly growing middle class, which has increased the domestic demand for meat. As a result, over the last decade, China has gradually shifted from a net exporter to a net importer of meats. On January 14, 2014, during an H7N9 avian flu investigation, China FETP residents collect environmental samples in a poultry market in Dongguan, Guangdong, China. Submitted by Shuqing Zhao – China. Source: CDC Global Flickr. China is also among the world’s top consumers for antibiotics, much of which is given to animals. In response to repeated outbreaks of avian influenza, China now requires that all poultry be confined. This decision is based on the idea that confined animals are better monitored and their owners better informed on safe animal management. Unfortunately, while this may reduce the prospect of future pandemics, this policy effectively eliminates small-scale farms and family chicken coops while promoting increased use of poultry CAFOs. However, scientists and public health experts largely agree that CAFOs can also play an active role in both the development and the spread of pandemic diseases, so it is unclear whether this policy will be effective over the long term at preventing the emergence of avian flu and antibiotic-resistant diseases. The scale of production and consumption in China makes CAFOs an attractive choice for producers, especially large firms such as the WH Group. However, the scale of production and consumption means that the negative externalities of CAFOS – including potential environmental and public health hazards – will likely be magnified in China. Our study of countries around the world reveals that the problems associated with CAFOs in the United States – the emergence of antibiotic-resistant diseases, environmental hazards, and greenhouse gas emissions – are the same issues that producers, consumers, regulators, and advocates must address all around the world. 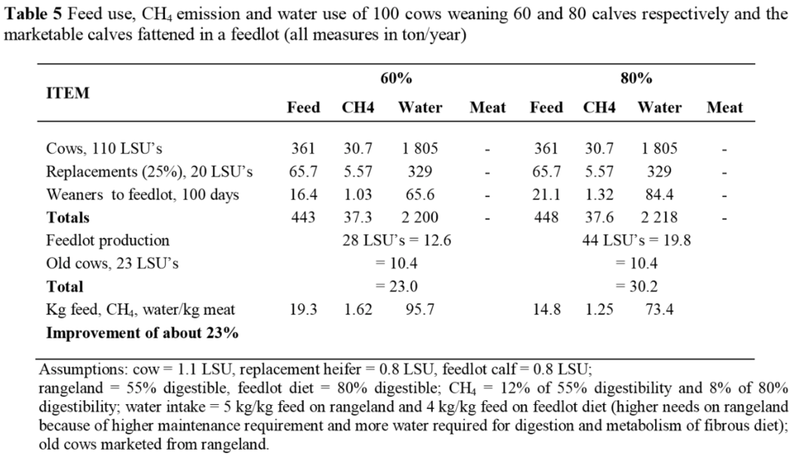 We found that policymakers were most effective at minimizing the negative impacts of CAFOs when they accounted for both the economic incentives and environmental costs, and least effective when they failed to adequately monitor, inspect, or enforce existing policies. A combination of regulation and market incentives, such as carbon offset programs, might be most effective at encouraging CAFO owners and firms to shift to waste-to-energy technologies. Similarly, the global landscape suggests that a combination of initiatives led by producers and consumers is likely to be the most effective. Concentration is the watchword not just for the farms themselves, but at the level of the firm. A few large multinational corporations now own or operate most of the world’s CAFOs, even if they operate with many subsidiaries in different places around the world. The recent buyout of Smithfield Foods by WH Group suggests that this trend of a few major producers supplying much of the world’s meat will only continue. Because there are so few players, even if one or two of these companies made a conscious choice to change their waste management practices for all of their farms, the effect is likely to be far more magnified than if there were many different firms, as is the likelihood that other firms will follow suit. Smithfield’s recent commitment to reduce greenhouse gases, as well as Tyson’s shift away from antibiotics and feed, suggest two such positive steps in that direction. Perhaps as a consequence of firm concentration, consumers have become increasingly cognizant of their role in effecting change in the food industry. Consumer movements have created new markets for products that contain fewer additives or preservatives, and reward companies that increase transparency and quality in their products (even if it results in a premium price). Through public education campaigns, eco-labeling, and other initiatives, consumers can exert direct pressure on the industry in a variety of ways, which may be exemplified by the move by Tyson Foods to eliminate antibiotics in animal feed. However, unlike the use of certain ingredients or broad animal welfare concerns, it is difficult for many consumers to connect a company’s waste management practices with the quality of the product they are purchasing (among other reasons, it is likely that many consumers prefer not to think of animal waste when buying food). This will be a challenge that consumer-led movements must overcome in order to demand change in waste management practices. In sum, animal waste management by intensive animal operations needs to change. The current system poses active threats to the environment and to the public health. Some of the public health risks are localized, a daily burden to surrounding communities that is invisible to the average individual. Other risks are globalized, such as the emission of greenhouse gases into the atmosphere. There are a wide array of policies that affect CAFO waste management practices in various countries where CAFOs exist, but none have effectively addressed these problems. Our research has revealed that perhaps the best chance for a lasting, effective solution involves a dialogue among these different stakeholders – consumers, farmers, and advocates. Animal waste is a challenge worth solving. our health, and the health of our planet, depends on it.